I have been breeding dogs for 11 years now. We are in Eagle Mountain, Utah. My kids and I fully participate in the care of our dogs and raising of the puppies. Our puppies are very well socialized with children of all ages and are used to lots of normal house hold noises and commotion. They are also raised around our amazing hairless Sphynx cats. We Specialize in red and apricot Miniature Goldendoodles. We also from time to time have amazing parti marked puppies. Our dogs we use for breeding are the best we can find, they are of great health, temperament and quality. Dogs that are used for breeding deserve to be treated like royalty. I am very proud of the dogs we own today. All of my dogs live inside the home and are treated like a part of the family. They get bones, always have chew toys available, only fed top quality food, they get daily attention and training which they enjoy. Our dogs are very happy dogs. They get to swim, run through water, play fetch, they get tons of attention everyday, and also they get cuddle time every night. They are kept clean and groomed. Our puppies are born inside my room next to my bed, so they can be closely monitored. I wake up every 3 hours to latch them to mom and check for any problems, for the first 2 weeks. That doesn't count the number of times I wake up, or run to check on them every time they cry, just to make sure something isn't wrong. After 2 weeks of age my kids start holding them and cuddling them, they hold them everyday and help with their imprinting by rubbing their ears, toes, tails, tummies, mouths, and by holding them on their backs and many other little things that help turn the puppies into great confident easy to train dogs and will help prevent nipping when older. They get tons of attention everyday. They get their areas cleaned several times everyday and sanitized once a day, they are bathed once a week and are used to the bathing process before going home. Our moms are given booster shots 1 month before being bred so that the new puppies get a higher immune system which makes for healthier puppies and less chance of contracting parvo. Our puppies are given their first vaccines at 6 weeks of age then are given another vaccine every 3 weeks as long as they are with us up to 3 vaccines. Moms and puppies are dewormed every 2 weeks until the puppies are 8 weeks old then they are dewormed every month like the rest of the dogs. We feed only the best possible food to our dogs and puppies. We feed Lifes Abundance food. 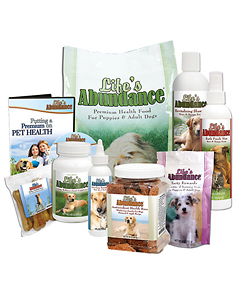 It is a very high quality holistic food with added prebiotics and live probiotics. We do highly recommend our puppies to continue to be fed this food once they go to their new homes. The food is very easy to get it ships right to your door. If you would like to order food or treats for your new family member just follow this link.